I was looking for a fun and creative way to display Christmas cards, and this is the best idea I have come across so far! Seemed pretty simple, and really adorable. Here is the original idea. Enjoy! 1. Paint half of the clothespins primary green. I painted the top and sides, let them dry about 30 minutes, and then painted the bottom and inside. 2. Paint the remaining half of the clothespins evergreen. 3. Paint half of the wooden beads red, and half of them green. Obviously if you were able to find wooden colored beads, you can skip this step. I recommend painting the top half of the bead, letting it dry, and then painting the bottom half. 4. Once the clothespins are dry, string one onto the wire through the spring in the center, making sure the side that clips faces away from/to the outside of the wreath.As a note, the original wire I got for this project was bead wire. Don't get that--it's too stringy and won't hold shape well for the wreath. It has to be a wire that is sturdy and malleable, but can still hold its shape. 5. Then, string a wooden bead onto the wire. 6. String the other green clothespin onto the wire through the spring in the center. 7. Continue to string alternating colors of wooden beads and clothespins until you reach your desired size. For example, primary green clothespin, red bead, evergreen clothespin, green bead, etc. 8. All right, this next step gets a little hairy, so take note. When you reach the size you want, make sure that both ends match up in the pattern of alternating clothespins and bead. Whichever end has the bead on it for the end, you will take the opposite wire and thread it through like so. Now, pull the wire nice and taut, so that the beads and clothespins are relatively stable and don't spin. Next, twist the wire together below the bead. Finally, bring both wires together and fold into a loop (you will use the loop to hang the wreath on a nail or hook). To secure, twist the wire at the base of the loop. 9. Attach the Christmas bow to the wreath. The ones I bought had twist ties on the back, so I twisted it on. For some ribbons, you may have to use a hot glue gun.You can hide the hanging loop by securing the ribbon on the top of the wreath, but I liked the look visually of the ribbon better on the bottom of the wreath. I have a confession to make. I am pretty bad at doing my own hair. Partially it's due to the fact that I don't have the time or energy to do my hair in the morning before work, and partially I don't know too much beyond the basics (i.e. braiding, ponytails, buns, etc.). But, I do like to experiment when I DO have the time. By request, this is how I straighten my hair on days I am not being lazy. As a note, straightening should not be done every day, as it can dry out and damage your hair. I recommend if you are going to straighten even a couple times a week is to apply a heat protection/anti-frizz hair product before blow drying and/or straightening. Two good ones I have used are Frizz-Ease and Garnier Fructis Sleek & Shine Anti-Frizz Serum. As a nice bonus, the Garnier one smells like apples! 1. Part your hair down the middle. As if you were going to put your hair up in a half ponytail, take your thumbs and draw them just above the ears from the front of your head where your hairline starts to the back of your head where they meet in the middle. Take all of the hair and twist it up and clip it to the top of your head, so it's out of the way. 2. Brush out the bottom half of your hair, and part it in half. Starting from the front of your hair, take a small section of hair and straighten from as close to the root you can possibly get, slowly drawing the straightener down from root to tip. A good rule of thumb is to continuously draw the plate down, not stopping. If you stop, you will get a crimp in your hair, which would be counter-productive! Continue to straighten from the front all the way around to the back. By having your hair divided in half, this process goes much easier, and it's easier to reach without making your arms tired! 3. Take the clip out, and let your hair down. Now, you are going to section your hair off again, but this time a little higher. Take your thumbs again and draw them just in line with your eyebrows from the front of your head where your hairline starts to the back of your head where they meet in the middle. Take all of the hair and twist it up and clip it to the top of your head, so it's out of the way. 4. Brush out the bottom half of your hair, and part it in half. Starting from the front of your hair, take a small section of hair and straighten from as close to the root you can possibly get, slowly drawing the straightener down from root to tip, just as before. 5. Take the clip out, and let your hair down. Brush out your hair, and part it in half. Starting from the front of your hair, take a small section of hair and straighten from as close to the root you can possibly get, slowly drawing the straightener down from root to tip, just as before. 6. Once you have finished straightening, spray 3-5 sprays of a glossing spray into your hands. Gently apply by finger combing through hair from root to tip. Doing it this way makes sure to coat all of hair, and not just have it concentrated in one area. P.S. As a bonus, if you are in a big hurry and need to take that hot flat iron with you, don't forget to check out my related post on a DIY flat iron cover, so you can throw that bad boy in your bag and go! This was a really simple idea for making your own Christmas tree ornaments that I saw on Pinterest. So here is the original idea. I actually will have a part 2 for this post when I find out how exactly to decorate these further (I have a sweet idea in mind), so stay tuned! 1. Take the top off of an ornament. Pour some Pledge into the ornament. 2. Gently swirl the Pledge around in the ornament, coating it entirely and thoroughly, and try to avoid making bubbles. 3. Pour out the excess Pledge back into its container, once the inside of the ornament is coated. 4. Pour a good amount of glitter into the ornament. And by good amount, I mean like 1/4 of the bottle of glitter. 5. Swirl the glitter around and cover the ornament entirely. You may need to add more glitter to fully coat, if you see gaps.I recommend to add a lot, put your thumb over the hole, and shake vigorously to coat all the way up to the top of the ornament. 6. Pour the excess glitter back into its container. 7. Clean the outside of the ornament with a warm, damp washcloth, if needed, to remove any glitter or Pledge. 8. Replace the cap, and repeat for the other ornaments. 9. When finished, add ornament hooks and hang on your tree! My skincare regimen has always been pretty consistent since I started getting acne around the age of 12 years old. I religiously cleanse and moisturize my face twice a day: in the morning when I wake up, and right before I go to sleep. In summer, I use a lighter, non-greasy moisturizer with an SPF of at least 10, and in winter, I use a heavier moisturizer that helps with dry skin. I generally switch up my cleanser every 3 months or so. It's weird, but if I stick to one product for too long, my skin becomes immune to it and starts breaking out. I use lukewarm water when cleansing. I gently pat my face dry witha towel, because rubbing it with a towel strips it of moisture. I also drink a lot of water throughout the day. These are simple tips you can follow to better skin care. I do a facial mask or scrub about once a week (you don't want to do scrubs more than that because you will end up damaging your skin or severly drying it out). I also use toner (usually with witch hazel) after rinsing off the mask, to calm and soothe my skin, before applying moisturizer. Remember, cleanse, tone, moisturize, and let it be your mantra. I met this lady over the weekend who was an esthetician. I have to say that I really was impressed by what she had to say, and she knew really her stuff. She also surprised me with some of the things she knew. The biggest piece of advice she gave me was for my age group (mid to late 20s), the best things for your skin are to cleanse, exfoliate, and moisturize. I was relieved, because that is already my motto. There were some new things that I learned and wanted to share. 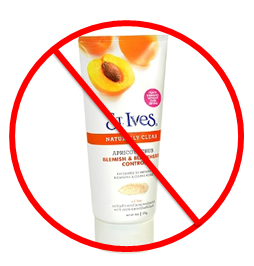 She also told me apricot scrubs are really bad for your skin long term. I was horrified, thinking of the one sitting in my shower at this very moment. She explained that if you look at an apricot scrub under a microscope, it has little hooks on it, and these hooks tear away the barrier of your skin over time and can cause permanent damage, like those brown spots old people get. YIKES! I will never use this again! She also told me that a lot of chemical peels that people get done at spas are so bad for your skin, and sometimes can put people in the hospital due to burns. Also, there are only 2 legitimate esthetician schools in Wisconsin, and all the others teach that this information about burns and side effects from chemical peels is often times left out to clients at spas. Scary! I have never had one of those done, but it definitely freaked me out. It also got me thinking, what other products am I using currently that could be potentially harming my body? Taking care of your body and skin is so vital because sometimes the damage that can occur from things like the weather, sun, smoking, etc. is irreversible and irreparable. Also, just because something claims to be all-natural does not mean it is the best or healthiest choice for you. She told us that as Wisconsinites, we are extra sensitized due to the harsh cold and winters we experience. Also, most facial cleansers you find on store shelves are loaded with colors and fragrances, which can be irritating to skin. Along those same lines, using soap is not a good option as a facial cleanser because it is very drying. I am going to go back and get a skin assessment to identify the major problems I have. Mine are for the most part blackheads in my T-zone and a bit of rosacea (pinkish pigment). She does free consultations, and she also does problem area sessions for only $35, which is not bad at all. Finally, she told me that women begin to use 1% of their collagen every year after 30, and 2% every year after menopause. That only gives me a solid 3 more years before my collagen starts to really deplete. Nooooo! Daily microfoliant, which is a formula that smooths and makes your skin look like porcelain. It is a powder that you mix with water and apply to your skin, continuously moving it around until it soaks in. And finally, barrier repair, which is a great moisturizer that feels super light and doesn't make your skin greasy. It melts into your skin on contact. I am going to do some research on more skincare treatments at spas and such and will do future posts on this topic also. Remember, it's never too early to start taking care of your skin. This Saturday was the first time I ever actually got nail art done in a salon. I was very impressed! This post is dedicated with props to Originails Salon & Spa in Hales Corners, WI for a fantastic job. This technique was made all with nail polish, and no paint. To achieve this look, all of OPI nail polishes were used. The base coat used was a sparkly gold (and the ring fingers a sparkly red), and then brown spots were painted over the base coat randomly. Then, black polish was used on some edges of the brown spots, and finally, a sparkly gold (not the same as the base coat) was added to give some depth. 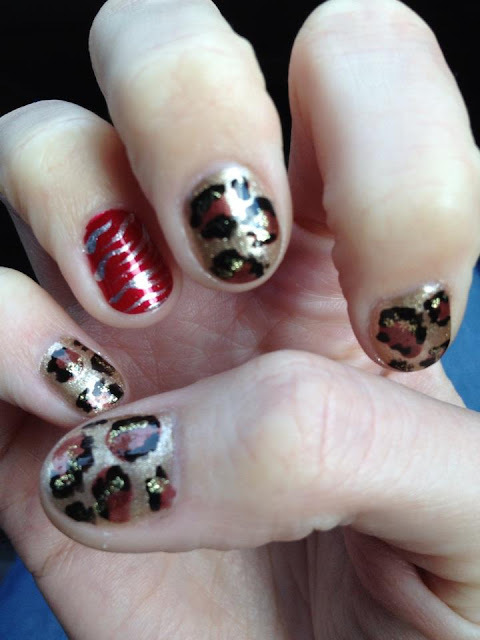 Then, silver polish was used over the red in horizontal lines to create zebra stripes. What do you think?